The foundatio n Fundación Impuestos y Competitividad values the current General Tax Act reform positively, a priori, for three basic reasons: it is a necessary component of the tax reform; it responds to the need to regulate certain matters not hitherto addressed; and it reflects the intention to tighten legal certainty, reduce litigiousness, prevent tax fraud and increase administrative effectiveness. 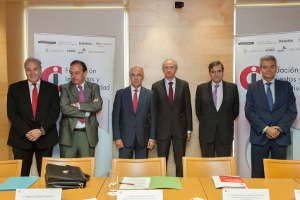 Despite this positive assessment, Fundación Impuestos y Competitividad considers it to be essential to point out that certain aspects that could have been included are lacking, such as some of the alternative dispute resolution measures or “cooperative compliance” solutions. For the Foundation, the reform is necessary to complete the tax reform and is an essential component of the tax system, not only to regulate “taxes” but also to determine their “application”, which is a relevant aspect in the Foundation’s opinion when evaluating the tax system. It also reflects the need for regulation in certain areas, such as the development of the reform of Offences against the Treasury, which has been pending since the reform brought in by Organic Law 7/2012; or the procedure for recovering State aid not specifically envisaged in Spanish legislation until now. According to the Foundation, the bill is passing through Parliament more slowly than in other recent legislative processes. The period for submitting amendments to the Chamber of Deputies’ Treasury and Public Administrations Committee remains open today, extending a process that began on May 21st. However, there is also room for hope that the parliamentary debate might address and improve some of the omissions or possible defects that have been identified by the Foundation. The scope of the reform is very broad and the Foundation has thus focused its assessment on some specific aspects related to legal certainty which, in its opinion, is an essential principle and an indispensable requirement for the “competitiveness” of our tax system, an objective to which the foundation aspires to contribute. Punishability of the “conflict in the application of tax legislation”. Doubts are raised as to the observance ofprinciples of legality and certainty which are required for the imposition of penalties. A considerable increase in the Tax Administration’s capacity to “control” the interpretation of the law. Amendment of the lapsing regime and inspection periods. The extension of lapsing periods and of the duration of inspections, and the elimination of effects for the unjustified interruption of administrative activities, clearly cause uncertainty and undermine legal certainty. Development of the new regime for Offences against the Treasury. Additional guarantees are lacking, in the so-called “pre-procedural phase”, for control over precautionary measures, or for the challengeability of assessments related to criminal fraud. Publication of the list of debtors. This solution raises numerous doubts and the envisaged regulation lacks full formal guarantees; its elimination should perhaps be considered, if that initiative by means of an Organic Law on the publication of tax fraud judgements, eventually goes through. Incentivise the voluntary fulfilment of tax obligations through measures that would have given rise to “cooperative compliance” or “reinforced cooperation”solutions, or even a declaration of potentially evasive transactions, in line with the Comparative Law solutions in neighbouring countries. For the purposes of reducing litigiousness, some of the so-called “alternative dispute resolution measures” are lacking. Indeed, the Foundation has recently presented a project on this matter. Our legal system should brought into line with the international trend in “anti-abuse clauses”. This matter is also addressed in the latest project presented by the Foundation.